To both snack and lose weight, it is important to pick healthy snacks for weight loss that are high in fibre, contain some nutrients, and have a low glycemic index. These balanced healthy diet snacks are more likely to be satisfying and filling, maintain your energy levels and keep your metabolism from crashing. Although it seems too good to be true, it is correct that regular, healthful snacking can actually help you to lose weight. However not all snacks are created equally. Surprisingly, the calorie count should not be the most important factor in determining if you should include a certain snack in your weight loss efforts. Many snacks that are high in sugar may not necessarily have a ton of calories. Yet they do not satisfy you for long. After the sugar crash you will be craving more snacks to balance out your blood sugar levels. Other snacks that seem harmless and healthful, like pretzels, are actually fairly empty. They will stave off hunger for only a very short amount of time, leaving you perusing the food cupboards again before you know it. These tasty treats are easy to make and store in the freezer to have on hand when you need a quick pick-me-up. In a blender, mix pears, fresh wheatgrass juice, a teaspoon of hemp seeds and some apple juice until you have a thick smoothie-like consistency with a gorgeous vibrant green color. Freeze in popsicle molds and enjoy! The pear provides important fibre and vitamins whilst hemp seeds supply healthy protein. Wheatgrass is a strong cleanser which provides long lasting energy and helps to stimulate and normalise your thyroid. Way more satisfying and healthy than chips and dip, this colourful snack is a feast for both your eyes and your stomach. The chickpeas in the hummus stabilize blood sugar to keep you from having binge cravings later in the day. Hummus also contains a lot of fibre to keep you moving wastes out of your body. The tomato, carrot, and celery provide important vitamins and minerals, and leave you feeling like you ate a lot of hearty food even though you didn’t consume too many calories! You may be tempted to pick up the lightest, fat-free yoghurt you can find, but this is a snack that you can splurge on and still feel good about. Go for the Greek-style yogurt, thick and creamy. 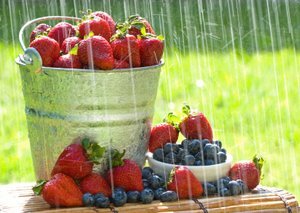 Mix in ½ cup or a cup of plump berries of your choice; blueberries, raspberries, blackberries or strawberries. You will feel like you are indulging in a dessert while providing your body with protein and important digestive probiotics. The heavier yoghurt “sticks” in your system for longer, making you feel full and satisfied for quite a while. This snack will satisfy you on many levels, being sweet, crunchy, salty, and creamy all at the same time. The apple provides long lasting healthful sugars and energy, while the almond butter fills you up and is a great source of protein. Many health food stores sell individual packets of almond butter that are great to throw in your bag, backpack, desk, or car, so there is no reason that this cannot be an easy and convenient snack to always have on hand when hunger strikes. The Japanese have known or hundreds of years about what a great snack edamame can be, but it is only recently gaining notoriety in other parts of the world. Boil frozen edamame (soybean) pods and pack them in tupperware or a bag to eat cold later on. Sprinkle them with a little bit of high quality sea salt, and edamame is one of the freshest and easiest healthy snacks for weight loss. It’s full of complete protein that contains all of the amino acid building blocks your body needs, while containing barely any calories at all. Skip dousing your popcorn in greasy butter. Instead, air pop it and top it with tasty herbs and a little sea salt. Prepared this way, popcorn is a good source of whole grain carbs, fibre and even has small amounts of protein. If you sprinkle with a tiny bit of the mildest cayenne powder or other spices that have heat, you rev up your metabolism which can help you lose weight. The good part is that you can eat about 4 cups of popcorn without having to feel guilty about overdoing calories. This can make you feel more satisfied and less like you are depriving your body of the quantities of food you may be used to. The chlorophyll in the seaweed in sushi rolls works hard to support and regulate your thyroid. If you fill these sushi rolls with brown rice, some toasted sesame seeds, carrot, and fresh ginger, you have a filling snack that packs a huge flavour punch. This is another snack that is crunchy, creamy, and salty, fulfilling your taste buds and making a big impression on your stomach. 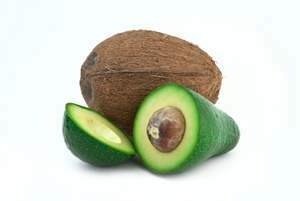 Most people shy away from avocados when trying to lose weight, because they do contain a relatively high amount of fat. However, all of the fats in avocado are good, healthful monounsaturated fats. Monounsaturated fats speed up metabolism, while saturated fats slow it down. Also, a small amount of healthy fat goes a long way in making you feel full. Anyone who has eaten fat-free cookies knows that it is not long before you are craving another snack. On top of this, avocados contain a high amount of mood-elevating B-vitamins...and when trying to lose weight, who couldn’t use a little mood lift? Miso soup contains only 25 calories per bowl, while providing you with protein and energy-boosting B12 and boosting your metabolism. It also gives you protective fatty acids, and is naturally salty for those times when your body is craving salt. With its low calorie count, you can feel free to add in carrots, fresh ginger slices, celery, or even small pieces of tofu for a more complete and colourful snack. Definitely add this one to your list of healthy snacks for weight loss because it is very easy to carry a sachet of miso soup with you when you're on the go: just add water. With 7 grams of fibre per ¾ cup serving, oatmeal helps in weight loss by keeping things constantly moving through your digestive system. Make sure to use steel cut or rolled oats, not the empty instant oats. With a low glycemic index, oatmeal helps you to feel full for a long time whilst it steadily delivers energy to your body. Add a splash of vanilla while cooking, top with blueberries and a sprinkle of cinnamon, and you will have a hard time remembering that you are trying to lose weight – a bowl of this tastes so good you will feel like you are treating yourself! Healthy Snacks for Weight Loss: A Final Important Tip! Another important tip when it comes to losing weight is to remember to drink plenty of fluids throughout the day. Not only does it help to make you feel full, but it will also help to flush out your system. Drinks such as fresh water, mint tea, fresh ginger tea with lemon, and kukicha or green tea do not add calories to your diet, yet make you feel satisfied by offering your taste buds many different flavors and sensations to enjoy. Remember that one of your best reasons for following a healthy eating plan is to respect your body and to treat it well. Healthful snacking when your body sends you signals that it is hungry is a way of honouring your body’s needs. Making good choices like these healthy snacks for weight loss will keep you from binging on other less beneficial options later on. So go ahead, enjoy!